At Murray Edwards College, we are aware that our clients are often doing all they can to benefit sustainability, the environment and their local communities and they need to use venues that reflect their own policies in this area. 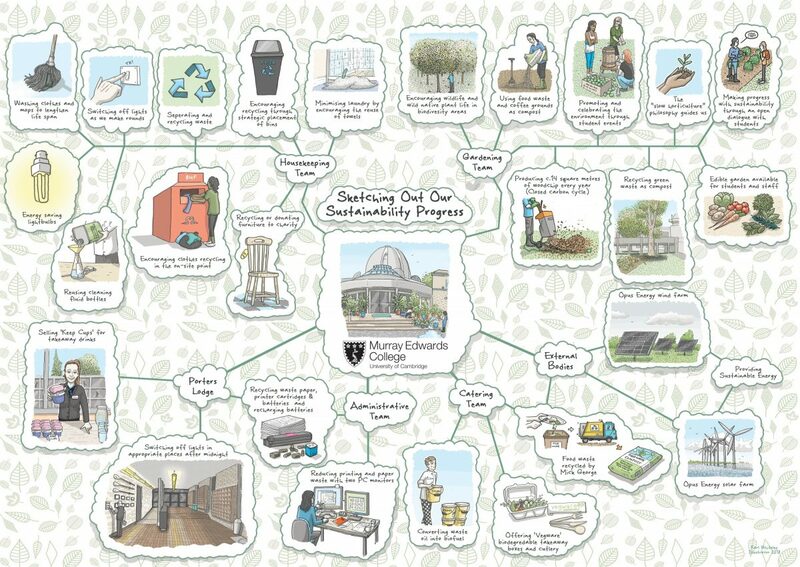 The Murray Edwards Events Team commissioned this graphic because we wanted anyone to be able to see at a glance all of the things we’re doing to improve our impact on the environment and to enjoy the experience of digesting that information. This format also means anyone can easily share it with colleagues and event attendees as part of the CSR (corporate social responsibility) element of event planning. We hope the graphic and this information is useful to you and that you will be reassured of our efforts to contribute positively to sustainability and the environment. We welcome any feedback and this can be provided via our Contact Form. If you would like to request a print version for use in your conference materials or you would like to feature it on your website, please send us a request via the link above. As many departments making up one Events delivery team, we align ourselves with the philosophy of ‘small changes’ – small changes lead to big improvements and because they’re small, they’re manageable and we can use them to build to a much larger overall improvement, without it affecting our work to produce fantastic events. As teams and individuals we care deeply about our environment, the wider world and its longevity. We recognise our responsibility to improve our practices and behaviours and minimise our impact on the environment and promote sustainable practices. Of course, the operational teams adhere to the College environmental policy which can be found here. The Murray Edwards College Catering team are also heavily invested in doing all they can to achieve as much as possible from the advice laid out in the Catering Managers Committee Sustainable Food Policy. This policy and work has won two sector awards. More information can be found here. Our sustainability journey starts from a strong position, as you can see from the graphic. We will be adding to this over time to illustrate further small changes and our on-going commitment to making the world a more sustainable place.